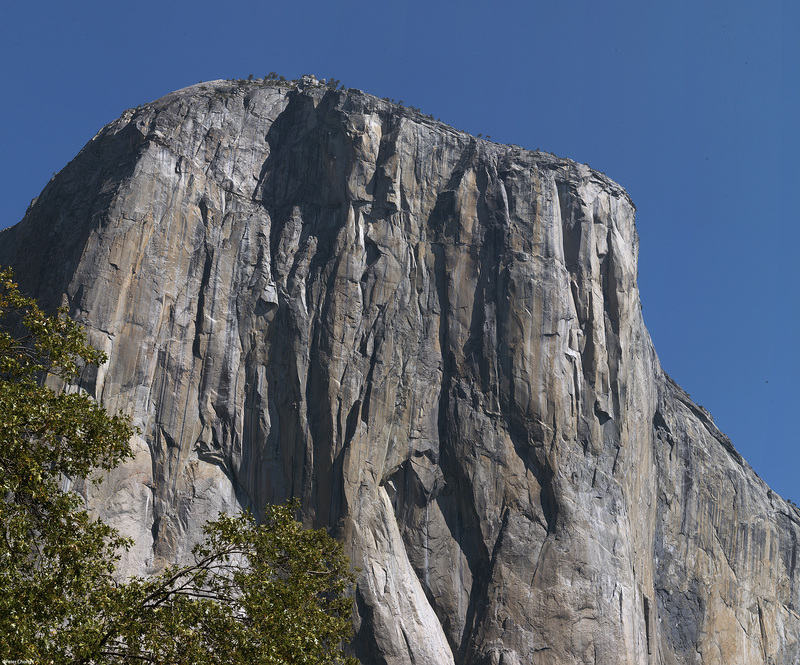 El Capitan, elevation 7569ft (2307m)...its name is imposing itself. A sheer piece of granite, rising 900m above the valley floor in one vertical face. Certainly not the highest peak in Yosemite, but one of the most dangerous to climg, and definitely one which almost forces itself on the viewer, due to the sheer face of the rock. 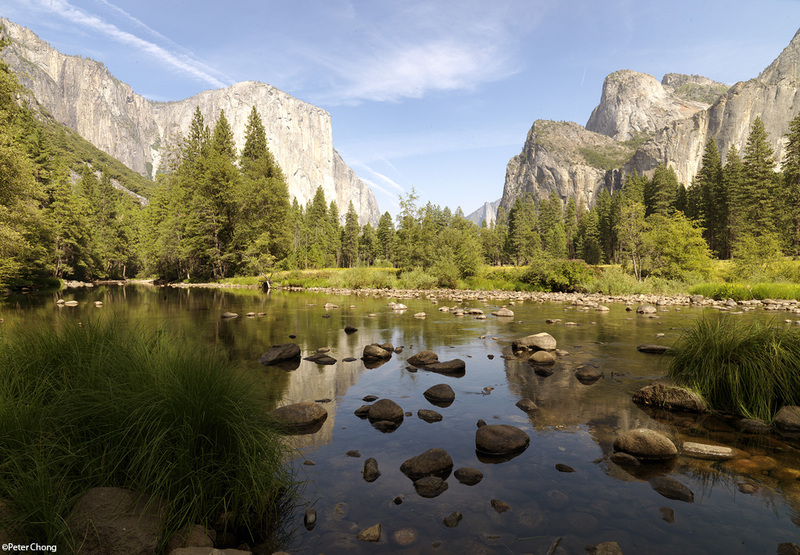 From the valley floor, the Merced River flows...at this time of the year, it is but a small stream. This shot was taken from the south bank, just before the turning at at the valley floor to the path which splits between continuing on the loop or right into Wawona. We found some respite from the summer heat in a cool pond...the water levels were low this September...I heard there was record water flow in the falls and rivers during the summer. 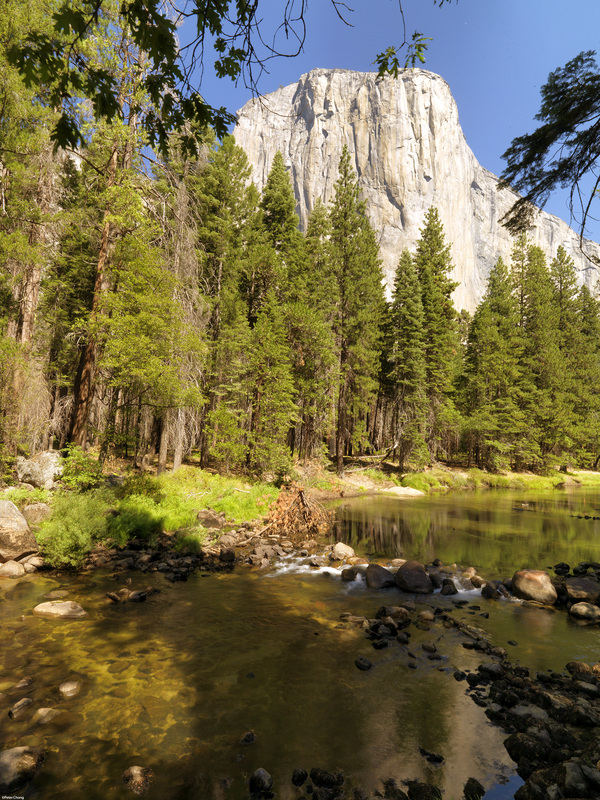 Here, a view of El Capitan on the left, and the Cathederal Rocks on the right, almost reflecting in the calm waters. I did develop another version of this shot, with a digital soft grad ND filter on the sky, but decided to leave the image alone as I had visualized this as a bright, light feel when I saw the scene. I metered to place El Capitan at about Zone 9, and allowed the rest of the scene to fall in place. 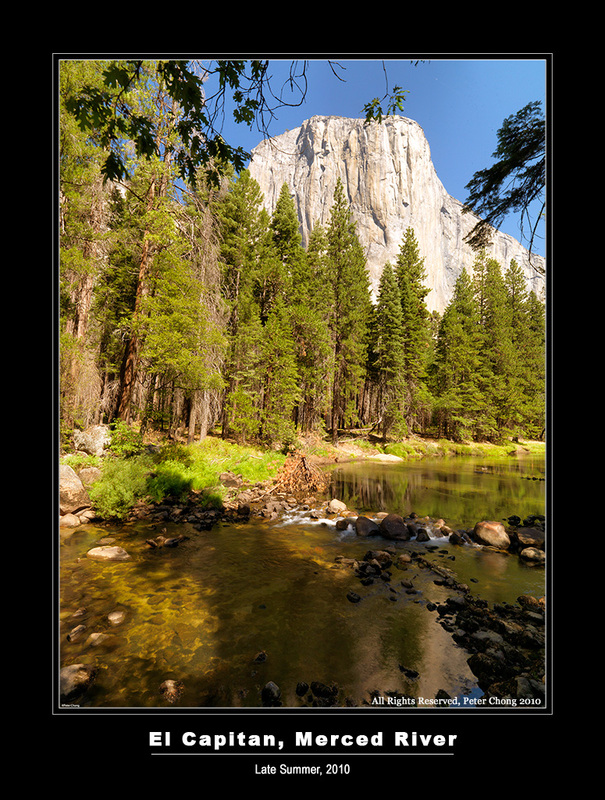 From just a couple of meters upstream, I shot this next shot, zooming in on just El Capitan and its surroundings, in portrait mode. Balanced with the water in the foreground, the imposing mountain looks in stark contrast to the inviting river waters in comparison to the hard, sheer rock. I selected the 28mm lens, and framed to include some branches of the trees at the upper cornerst o give reference to the scale: a treatment which use the foreground/background relationship to establish scale and distance. The trees at the foot of the mountain are huge pines, towering some 100m above the ground. Metering was taken using the main subject as the source. I wanted to place the lightest part of El Capitan almost at the white limit - suggesting that it almost shone in the sunlight, as it did that day. I placed the brightest at Zone 9. The 16 bit afforded by the medium format back meant that I had sufficient exposure lattitude without having to resort to a graduated filter which would have been typically employed in the film days, or even with a 14 bit 35mm digital camera. But the Hasselblad had sufficient dynamic range to cover details both in the shining rock, and the dark shadows. Using this metering scheme, the darkest parts of the of the rocks and water at the lower right registered Zone 1. This allowed the lower left to have the sunlight flirting with the water...crystaline clear, showing the rocks. The next shot, taken from El Capitan Meadows, showing a detail of the South West face and intended to give the impression of a forbidding presence. Strong, powerful. This is a 2 panel stitch from a panorama with about 50% overlapping images. Shot with the 120mm lens. Exposed such that the shadows of the cracks within the rock is in Zone 5.